With more people opting for two wheels to get around, today we’ll be looking at the Snoozer Bicycle Pet Basket. Ideal if you have a small dog or pet that you want to ride along with you, the pet basket fits neatly across the handlebars of most bicycles. Smaller dogs tend to want to be with their owners all the time. The truth is they can get pretty fractious if left alone for a prolonged period. That’s why miniature dog owners spend more on pet carriers than anyone else in the United States. If you like to get on your bicycle, then finding the right pet basket is crucial. You want your dog to be both comfortable and secure. For a start, you don’t want them jumping out of the basket when you hit an uneven part of the road. In our Snoozer Bicycle Pet Basket Review, we’ll look in detail at what the pros and cons of buying one are, what customers are saying about the product and who it works well for. CLICK HERE to See Real Customer Reviews & Pricing Information on Amazon! There are options if you want to take your favorite small dog with you on a cycle ride. The first is to opt for an over the shoulder pouch, one that keeps your dog close to your chest. Another is the more traditional pet basket. Both of these solutions have their merits. We’d say that the pet basket is slightly safer. If you fall off the bike, your dog isn’t tied to your chest for one thing. Of course, you could always go for a bike trailer which fits behind your bike and many owners choose this option for bigger dogs. For smaller dogs, however, it’s not always the best option. If you have a Chihuahua or a Shih Tzu or other small breed of dog, the front bicycle pet basket is a pretty good choice. It’s easy to install over the handlebars, and the only thing you’ll have to worry about is getting your dog used to sitting there. Apart from the initial training, you will have to get used to riding a bicycle with a dog sitting in a basket in the front. Fortunately, the Snoozer Bicycle Pet Basket is compact and stylish, and most customers find it a fun way to travel with their dog. Our review will take a close look at the pros and cons of buying a pet basket like this and what you can expect once you get it out of the packing. Snoozer is a small, US company run by dog lovers. They produce a wide range of different products such as dog beds, carriers, and car seats, all specially designed for our canine friends. For those owners with older dogs, the company also develops orthopedic solutions. These include dog ramps for getting up onto couches as well as specially designed beds for pooches with aching joints. The basket is 10 x 13 x 10 inches in size. If you have straight handlebars, it will fit a little less than the width of these and just about down to the top of the wheel arch. In total, the Snoozer Pet Basket weighs about 4 lbs. It is suitable for carrying dogs under 14 lbs. That makes it perfect for pets such as miniature dogs. There is a choice of four different color combinations: Gray/black, red/gray, orange/gray/black, and pink/gray/black. There are several things that you’ll need to consider before buying a bicycle pet basket for your dog. The first, of course, is whether they are going to take to it in the first place. The open nature of the basket is not suited to more excitable dogs. Training a dog to sit calmly in a pet basket takes a little time and patience. First, you need to get them used to the basket. The next step is to put them in the basket and walk your bike around. We suggest riding short distances after that and avoiding anywhere there are huge distractions such as a lot of traffic or people. 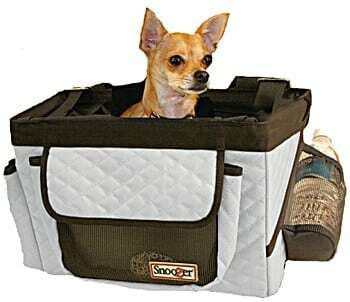 The Snoozer Pet Basket is capable of taking small dogs such as Shih Tzus and bichon frize up to about 14 lbs. The basket comes with comfortable inner padding that can be removed and cleaned in a washing machine. As with many baskets, there is a chin rest, but this one is made of soft material rather than hard plastic. There’s a rain cover to protect your dog during inclement weather. It’s easy to install on your bike and remove and doesn’t interfere with the steering. The buckles are thick and sturdy, placed 10 inches apart and hold the basket reasonably firmly on most bikes. There is a leash clip inside the basket which prevents your dog from suddenly jumping out. 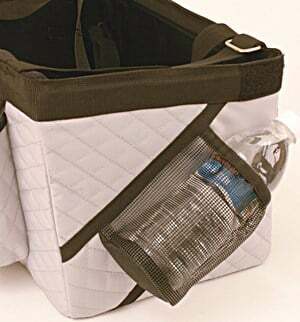 The Snoozer Pet Basket comes with some neat pockets for storing things like water bottles. You should check what sort of bike you have. The basket doesn’t fit well if you have low handlebars – you need at least 10 inches clearance between the bars and the top of your wheel hub. While in most cases they are quite sturdy, on some handlebars the straps can slip a little. It’s not just weight of your dog you have to consider. These not be suitable transport for longer dogs as they don’t have enough room to sit comfortably. Once you’ve got your dog used to traveling in the pet basket, you should find that they stay relatively calm. It’s deep enough for small breeds, and the basket is perfect for short trips as well as long rides out in the country. The padding inside is vital for a comfortable ride for your dog. Bicycles can go over uneven ground, and that quickly gets transferred to the basket. The Snoozer Pet Basket seems to cope with this pretty well compared to other products. CLICK HERE to Buy Your Basket Snoozer Bicycle Pet on Amazon! 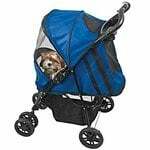 This is an ideal addition to your dog gear if you cycle a lot and want to take your pooch with you. Smaller dogs tend to prefer to be with their owners anyway. The basket fits easily over the front of your bike and can be folded away and stored when you don’t need it. If you’re heading out camping and taking your bikes with you, this is the perfect way to ensure that your dog can come along too. Other customers use their bikes in the city or busy towns and find that the Snoozer Pet Basket is the best way to get their dog around with them. As you might expect, the Snoozer Bicycle Pet Basket has proved quite popular with customers. With so many of us nowadays swapping our cars for bikes more often, it’s no surprise that owners want to accommodate their pets as well. Compared to other pet baskets for bicycles, this one seems to be a lot sturdier. Customers have commented on the firm base and that they don’t have to worry the basket is going to rock about. There may be some tweaking to be done to install the basket, however. One customer had to move the brake cables, but once this is done the basket should be secure. Most customers advise a simple process for getting your dog used to the basket. First, place the basket on the floor and entice your dog in with treats and rewards. Next, buckle in the dog and walk around with them. Then you can move onto short rides on the bike. For most, this seems to work pretty well. Some owners with two small dogs find that there is plenty of room in the Snoozer basket to hold both at the same time. Larger dogs have been known to fit into the basket, but most customer suggests that around 13 to 14 lbs is the ideal weight area. Customers can have problems if they don’t fit the basket properly and it’s worth going out on a test drive or two to make sure everything works before taking your dog. Smaller or lower handlebars can be an issue, but issues are often down to not securing the straps correctly. 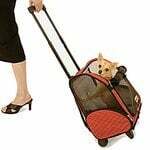 Once you have gotten your dog used to traveling in the basket, many customers say, you still need to take it slow for a while. Some dogs can get ‘freaked out’ when you turn corners or go over bumps. On the whole, though, most customers who bought the Snoozer Bicycle Pet Basket have given positive feedback and say that their dog likes it. Many can’t seem to live without it. If you own a bike and regularly use it, this is the sort of dog carrier that can make a big difference. It’s used by cyclists in towns and cities as well as out in the country. This is also an excellent product to buy if you often go camping and take bikes with you for rides in the country. The Snoozer Bicycle Pet Basket comes in a variety of colors. While it’s slightly more expensive than other models in the same category, it’s a carrier that many small dogs love. This is undoubtedly one mode of transport you’ll want to look at more closely. CLICK HERE to Buy this Snoozer Bicycle Pet Basket on Amazon!